At first thought, it’s hard to even comprehend something like a 7,000 pound 18-wheeler with a 36,000-horsepower engine capable of reaching speeds of 300 mph while burning 120 gallons of diesel fuel every time it runs a quarter mile. It’s hard to imagine anything more impractical. It’s hard to imagine anything more wasteful. It’s hard to imagine anything more environmentally irresponsible. It’s also hard to imagine anything that would be so incredibly cool to watch. Well, actually, there is one thing: If that truck raced another truck. That’s what race fans will get the chance to do when two “Jet Trucks”—the “Shockwave” and “Super Shock Wave”—face off on a quarter-mile drag strip at the Salt Lake Nitro Jam Friday and Saturday night at the Rocky Mountain Raceway. It’s the first time an actual Jet Truck race will be held anywhere in the Western United States. Salt Lake City is one of 10 Nitro Jam tour stops in the United States and Canada. Besides the trucks, there will also be a full complement of other types of drag racing on Friday and Saturday. Racing will be held throughout the day on both days, with a FanFest running from 5:30-6:30 both evenings. The top levels of racing begin at 7 p.m., with the “Night of Fire” commencing at 8:45 p.m. Saturday night will conclude with a fireworks show. But let’s be honest. 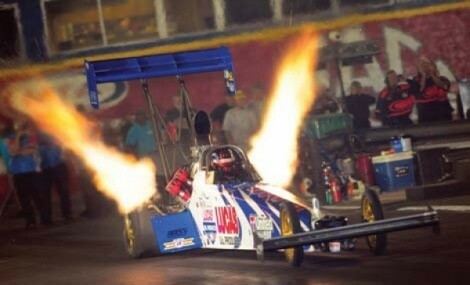 That fireworks show won’t seem like much after watching a Jet Truck race.